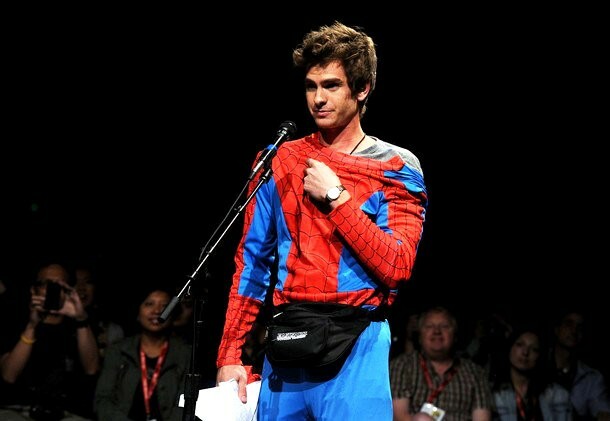 The Amazing Spider-Man star Andrew Garfield gave a very passionate speech yesterday during the Comic-Con panel. He came up to the Hall H floor mic dressed as an average Joe Spider-Man fanboy, so no one would recognize him, and began to talk about his excitement about being at Comic-Con. He eventually reveals his true identity to the geek crowd and talks about how Spider-Man influenced his life. The guy truly loves this character, and he gets very emotional about it during his speech. Watch it below and tell us what you think! Garfield seems like a very humble likable guy. To read our Amazing Spider-Man panel coverage Click Here.